Empxtrack has been listed on ADP Marketplace with an aim to cater to end-to-end Performance Management needs of ADP customers. Empxtrack software is highly customizable, configurable and meets unique requirements of organizations. With intuitive interface and easy navigation structure, Empxtrack Performance Management has been designed to improve user experience, increase software usage, provide analytics on the click of a button and maximize ROI. The product is used by companies in more than 20 countries. 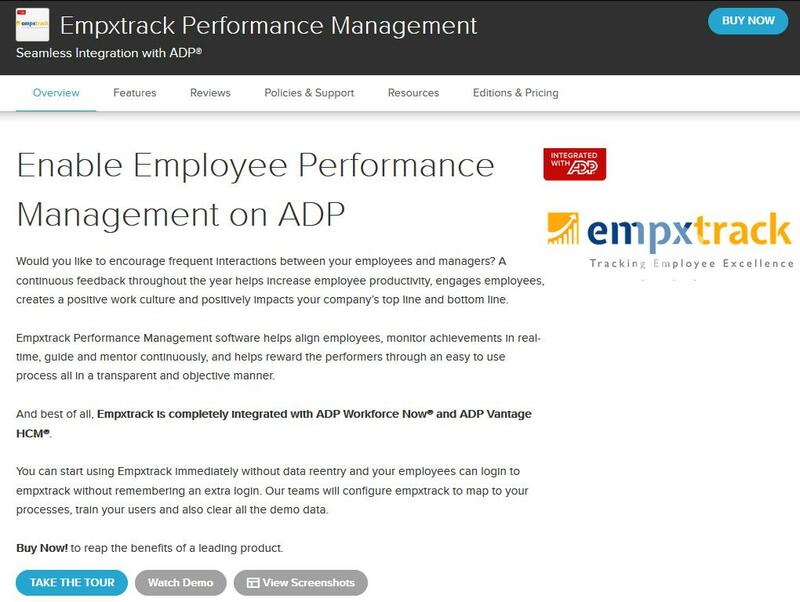 Follow the steps below to purchase Empxtrack Performance Management on ADP Marketplace. Kindly note that you have to be an ADP Workforce Now or ADP Vantage customer to purchase Empxtrack on ADP Marketplace. Step 1 Go to ADP Marketplace (https://apps.adp.com/home). Step 2 In the Search Box type “Performance Management”. Empxtrack appears on the first page in the search result. Step 3 Check out product overview, features, videos, product screenshots, and more by clicking on the View Profile button. Or select Compare checkbox to compare Empxtrack features with that of other products. 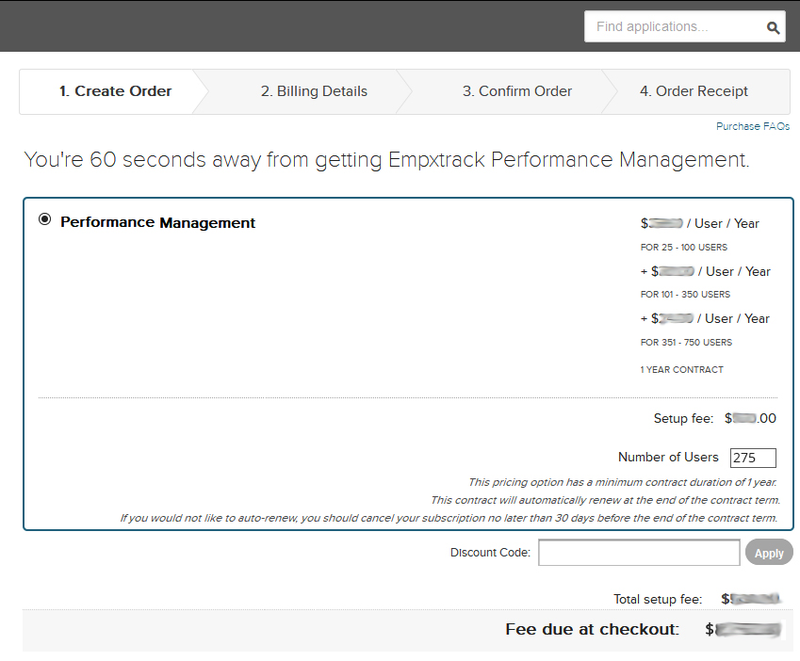 Step 4 Go to Buy Now button to purchase Empxtrack Performance Management. Step 5 Login page appears. 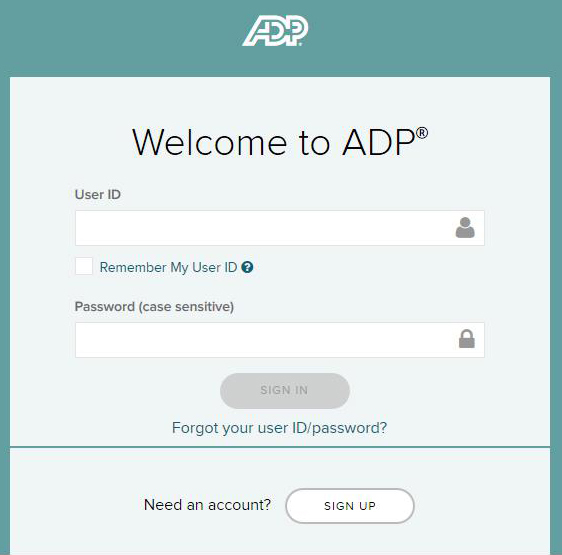 ADP users can use their login credentials and initiate purchase process. Step 6 The page appears where the user can Create Order (as shown below). Apply Coupon Code if you have any and the proceed to get Billing Details and Confirm Order. The purchase process completes with getting Order Receipt. 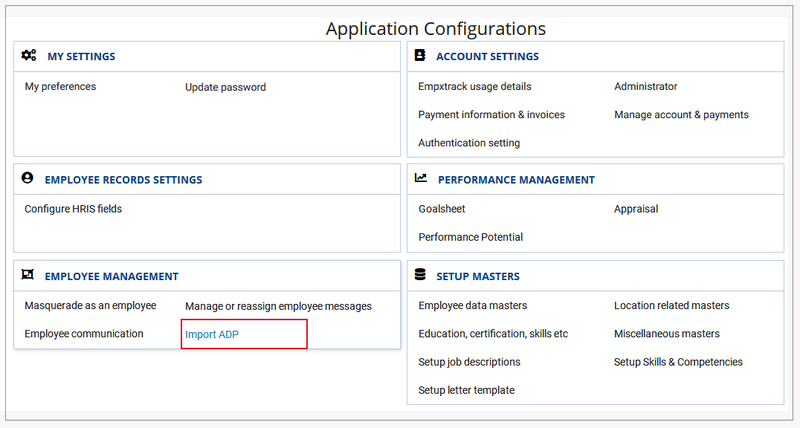 Step 7 Go to MANAGE APPS >> Account >> Applications to see listing of all the applications purchased from ADP marketplace. 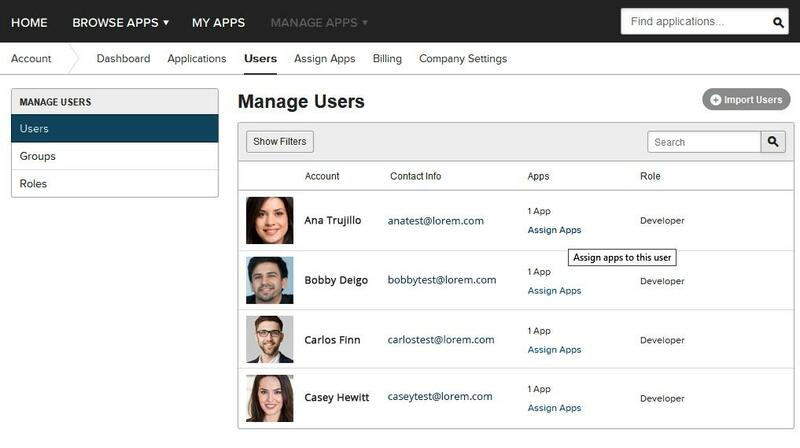 Step 8 Go to Manage Apps >> Account >> Users to manage users. 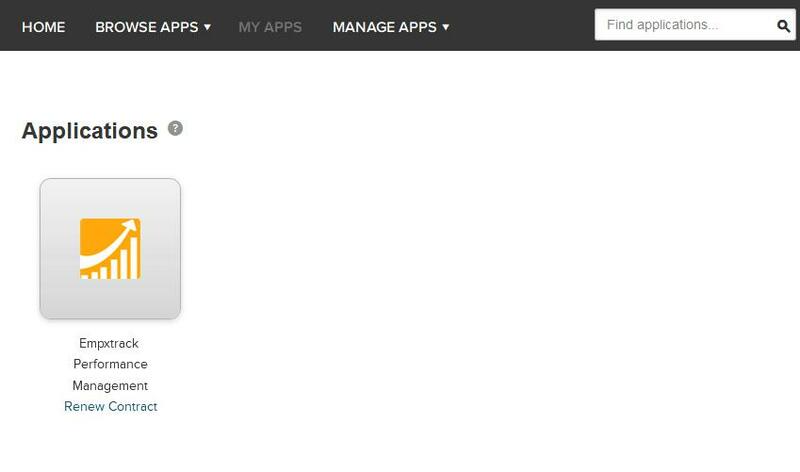 Step 9 There are two options available (a) Assign Apps to User and (b) Assign Users to Apps. Choose the first option as shown below to assign Empxtrack to any number of users. Step 10 Login to Empxtrack through Single Sign-On (SSO). The image below shows SSO login link to give access of Empxtrack application to the assigned user. 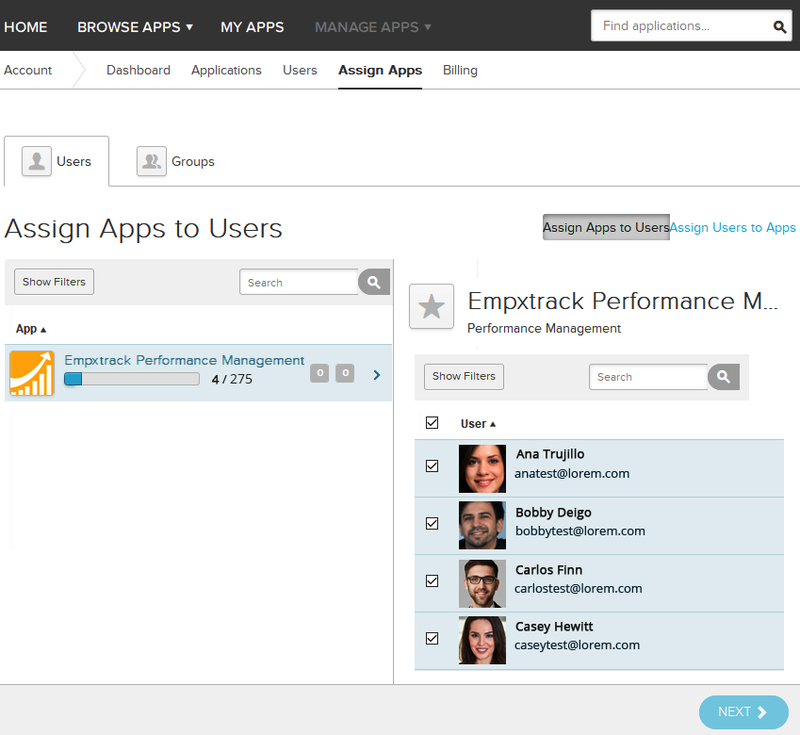 Step 12 The user gets access to Empxtrack app and the Home page of the application appears. The employee can now start using the application. (a) Import ADP data frequently by running weekly scheduler on every Friday midnight. Scheduled ADP data updates will be enabled by us once the product is live. (b) Input ADP data manually. Login as Admin, go to Import ADP as shown in image. The client id and client secret key are generated. Click Next. The entire employee data is shown. Through the strategic partnership and industry-leading integration, ADP and Empxtrack have come together to add more value to their offerings. Empxtrack Performance Management is seamlessly integrated with ADP Workforce Now® and ADP Vantage HCM®. Through a single-sign-on feature, ADP users can save time and effort in setting up and maintaining multiple user accounts. Get a quick, secure and convenient way to authenticate single sign on across multiple systems. Better experience for the entire team to maintain control over confidential information. ADP and Empxtrack are collectively offering Integrated solutions to overcome performance management challenges and maximize employee productivity. Input data only once and it will immediately update in the other systems. Employees profiles are automatically updated without additional effort. Weekly scheduler keeps updating employee data on regular basis. Empxtrack has assigned a dedicated account manager for each ADP client to streamline talent management process. ADP customers can quickly log in to the Marketplace, purchase the system and go live with Empxtrack in less than an hour. The process is extremely quick and hassle-free. Configuring a product can be overwhelming at times. As a valued ADP customer, Empxtrack will be happy to configure the same for you at no extra costs. A specially designed version of Empxtrack Performance Management System is available on ADP Marketplace, with relevant terminology. Besides, the users get tons of customization options, including change in fields, ratings, workflows, forms and more. Take help from dedicated support team with in-depth knowledge of Empxtrack and ADP integration.